Welcome to our new monthly newsletter! Each New Year is a new opportunity. For the Blue Route, 2015 brings the potential to finally start building Nova Scotia’s provincial cycling network and to complete our first on-the-ground project. BNS is committed to seeing Blue Route signs go up this year and we are confident that with the help of our supporters we will. We’ve come this far through the dedication, enthusiasm and support of many around the province, so let’s keep at it and make 2015 the year that brings provincial bikeways to Nova Scotia. BNS closed out 2014 with a series of seven regional stakeholder workshops across the province. We set out to raise awareness about the project, share a status update, and engage communities with the planning process. Groups that play key roles in the shaping of bicycle friendly roads, trails, and communities were invited, including elected officials, provincial and municipal staff, and community advocates and volunteers. We hoped to strengthen relationships between communities and the project while getting advice on routes and decisions. We hosted workshops in Englishtown, Antigonish, Truro, Halifax, Berwick, Yarmouth, and Bridgewater. Turnouts were impressive in each town and we learned a lot about how to improve and advance the project around Nova Scotia. We will be using what we’ve learned to update the proposed route and are hoping to develop new partnerships with communities that are ready to play a role pioneering the Blue Route. We know a lot of you are ready to get started! Thanks to all who joined us for the sessions and dedicated your time and energy. Thank you as well to the Department of Health and Wellness Active Living Branch and the staff for partnering on the engagement sessions as part of their Provincial Active Transportation Policy Framework workshops. For those who weren’t able to join and are looking for more information, please get in touch with me at BNS. We will be making a workshop report available shortly to share what we heard. One of our first objectives for 2015 is to make information readily available with the launch of the official Blue Route website. We know a lot of you are eager to get involved and the first step is to give you the information you need. We hope the website will be a great resource to help Blue Route ambassadors around Nova Scotia promote the project in their community and become a tool for raising awareness and developing new partnerships. Look for that to launch early this year. As we look forward to big things for 2015, we would like to thank all of the people and organizations that contribute to the Blue Route, beginning with the Province for its support of BNS and commitment to advancing the project. In particular we would like to thank the Department of Health and Wellness for supporting BNS’s work on the Blue Route, Transportation and Infrastructure Renewal for taking the lead in Government and making the project possible, and the Department of Energy for supporting the Blue Route through Nova Scotia Moves and the Sustainable Transportation Strategy. Thank you as well to all of the members of the Blue Route Team who have devoted so much of their time to this project. Finally, thank you to all of the community supporters in municipal government and NGOs who are committed to bringing the project to life, and to everyone who believes in the vision of a provincial network of bikeways in Nova Scotia. We are thrilled to have you all on board and are excited to see what we can accomplish together in 2015! The Bicycle Nova Scotia AGM is coming up! Date and location are not yet set, but it will be sometime in the month of February. We'll let you know as soon as we have the details sorted out. Bicycle Nova Scotia is made up of passionate individuals that believe in cycling culture and all that it brings to the region and its citizens. Our board is the foundation for all that BNS accomplishes and those involved work persistently to make this organization the best it can be. As with all things though, change happens and people move onto other things. Some changes are happening within the board, meaning that opportunities are opening up for others to get involved. Listed below are some positions that are opening up in BNS. If you, or anyone you know, are interested in coming on board, please get in touch with us. We can answer any questions you have and fill you in on the details. * We will be sending another note soon with the full descriptions of the positions and what their responsibilities entail. 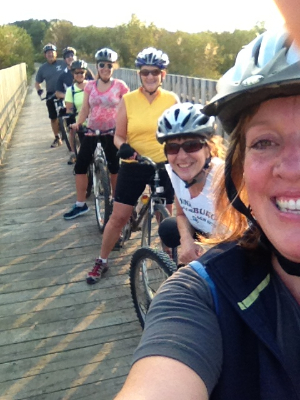 Over the past year, a group of staff (and some of their family) from the Municipality of the District of Lunenburg got together and biked most of the rail trails in the District - about 100 kms so far. We met after work once or twice a month, biked a trail section, and took some amusing group pictures! The routes were completed in sections of 10 or 15 km each visit, and sometimes even finished with a treat or a meal at a local restaurant. It wasn’t a great feat of distance or difficulty, but it certainly was a fun way to explore our local community trails on a bicycle. It also taught each of us how easy it was to help meet our commitment to being physically active and offered friendship and laughs through shared experience. We are already making plans for 2015. There are trails left to explore, lots of stories to tell and moments to reminisce about with each other – a great way to encourage others from the office to join our group! The selection committee for the Annapolis Valley destination trail branding has chosen the submission from firms Upland/Breakhouse to award the project to. The work of Upland/Breakhouse should put us on the map, with staying power. Their work is award-winning and notable. Have a peek through www.breakhouse.ca and www.uplandstudio.ca and you will see where we’re headed. 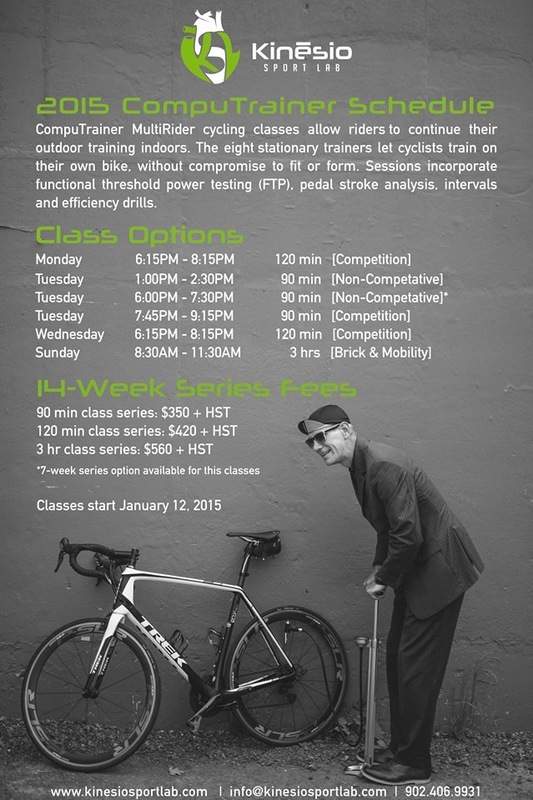 The Challenge consists of riding your bike outdoors for a minimum of 30 minutes, once per week, all year. 2015 will be the 8th year this challenge has been happening. The 52-WBC is a wonderful way to stay fit, keep the bike culture alive all through the year, and give the bike a taste of the outdoors all year long. Register by emailing the Coordinator as early as you can. Download and use this Mileage Record Spreadsheet (Excel). It is a fun way to keep track of your mileage is keep notes about your outings. On top of adding up your total mileage for the week, for the month, and for the year, it calculates for you the average distance of your outings, your average mileage for the month, and daily for the year. Also, you can enter Comments for every day of the year, i.e. where you rode, temperature, wind direction, people you met, highlight of the ride, etc. To enter a comment, put your cursor on the date you wish to make an entry, go to Insert, click on Comment, and type in the yellow box that appears. Close the yellow box by clicking on the small button on the upper left hand corner; a small red triangle will remain in the box. To view your comments, click any box of the spreadsheet and with your mouse go over any date there is a comment, without clicking - the comment will immediately appear. At opportune times during the year, Shelley Porter (the Coordinator for eight years now) will e-mail pep talks and will send updates to participants. The Town of Bridgewater was thrilled to be awarded $8,900 through the 2014-2015 Nova Scotia Moves program to support our Bike Rack Project. 39 stainless steel bike racks, with an attractive, modern design were donated to the Town of Bridgewater by the Lunenburg County Lifestyle Centre. Most of the racks have now been installed throughout Bridgewater in approximately 18 locations. Most are situated in visible, accessible locations in our parks, playgrounds and green spaces. A few of the racks will be situated in workplaces such as the Town Hall, Fire Department, and Desbrisay Museum, making it easier for workers to choose an active way to travel to and from work. 12 of the racks are being placed at the local elementary and Jr./Sr. high school. The Integrated Community Sustainability Plan, where the key strategy is to provide more transportation opportunities in the town. The Downtown and Waterfront Master Plan, which has a goal of making the downtown area of Bridgewater more walkable. We are also extremely proud to be a supporter of the United Way of Lunenburg County “Bikes for Kids” program, where we collect new and gently used bikes during the fall, which are refurbished by volunteers in the winter and then distributed in the spring to local kids, who would otherwise not have one. The bike racks complement this amazing program by providing these kids with a place to lock-up their “new“ bikes safely. Adding these racks to our community will help to promote inclusion and make the town more accessible to people of all ages, with varying socioeconomic statuses. If there are any unused funds at the conclusion of this project, it will go towards another valuable Active Transportation project. 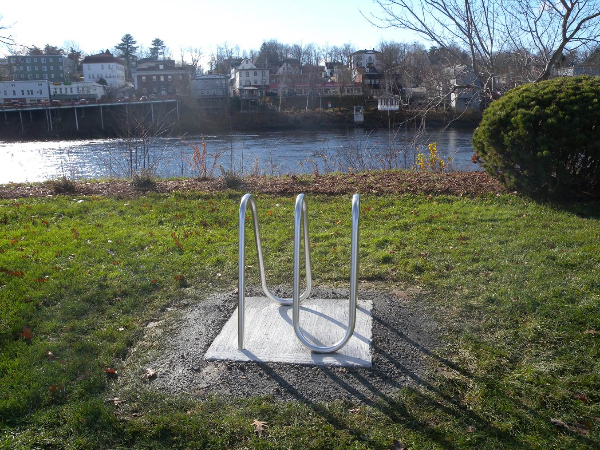 The Town of Bridgewater Sustainability Planner, Engineering Department, and Active Transportation Committee all played a part in helping the Parks, Recreation & Culture Department make this project happen. We are truly grateful to the Government of Nova Scotia, Department of Energy, and all partners who made this project possible. We invite all cyclists to make Bridgewater one of your trip destinations the coming year! We hope that our bike rack project has given you one more reason to visit us. Get a second crack at our Gorge DH race course, but this time with a bit of snow. Worry not, if mother nature won’t provide us a with a bit of snow, we will find some at the local rink and shovel it on course. Snowy sections are guaranteed! One timed run for the DH race, full face helmets required, armour recommended. Ages 15 and up. FREE rental helmets available on a first come first serve basis. Cost: $10 per rider + BNS license (day license available for $25 extra). Registration opens at 9:30, Practice starts at 10, Race Runs starts at 12:00, Long jump/ skills park challenge, awards/ prizes to follow. Also look for the return of our long jump competition and new events including a timed skills park race and more. Tackle all events and take a shot at the grand championship! Meet at The Gorge main trail head at the end of Gladys Porter Drive in Kentville. HeartLand Tour dates for 2015 have been set.